I know some like myself love coming up with ways to store their cherished miniatures and I'm sure others probably aren't as enthused. 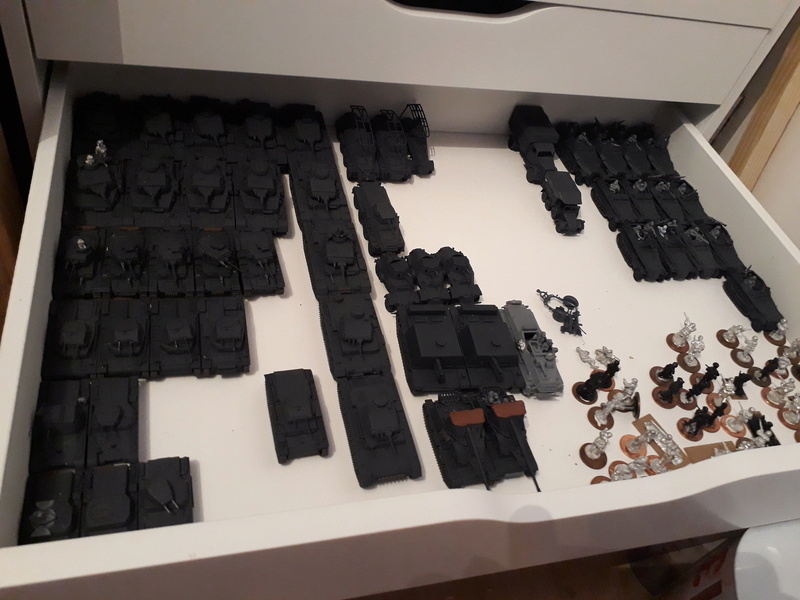 But either way I thought a thread about miniature storage would help others get inspired on ways to store their ever increasing collection. 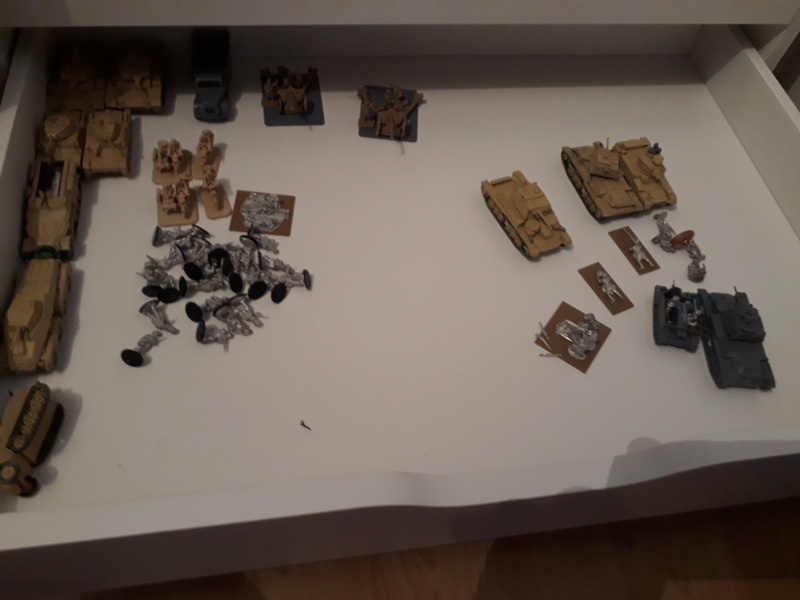 So if you have something to share or have questions feel free to post them here, whether its a DIY project or a product designed for miniature storage. I'm interested in what others are using to store their collection. 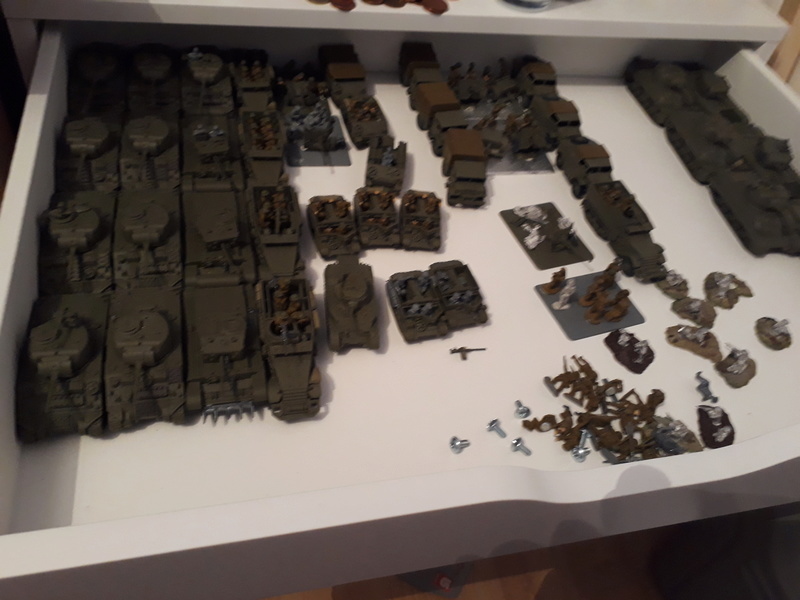 My 6mm storage system. 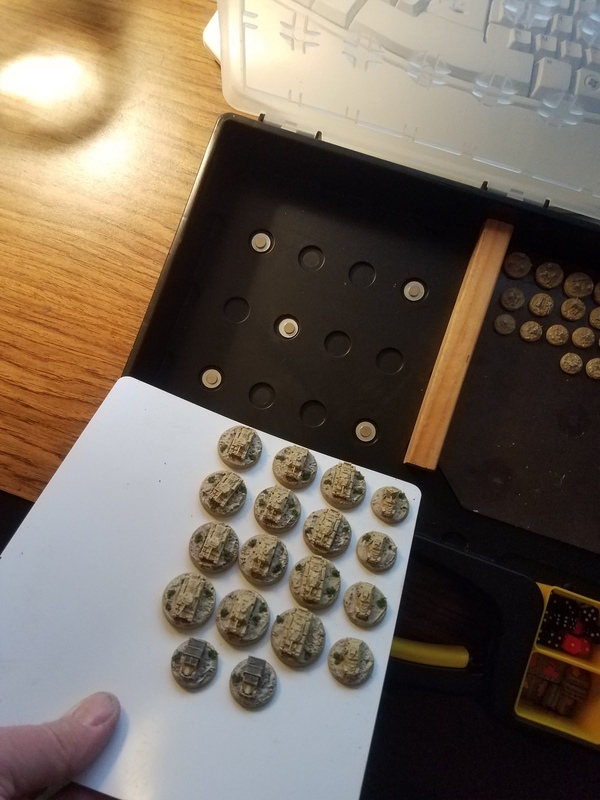 The mini's are mounted on washers and stored on a magnetic pad, the pad is held in place by magnets glued in the case. 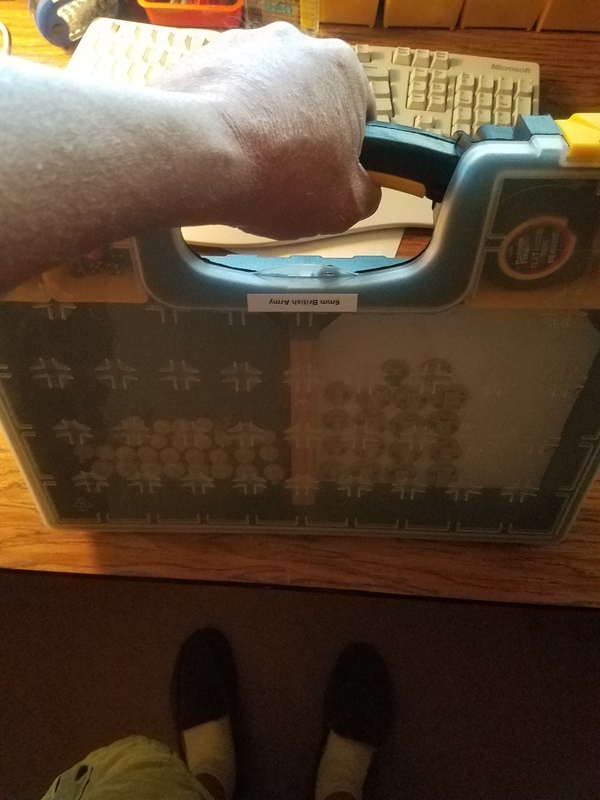 The case was designed for screw/bolt storage and was filled with a various size bins, I used some for storage of game tokens and dice etc, the rest I use for storing paint and supplies on my workbench. 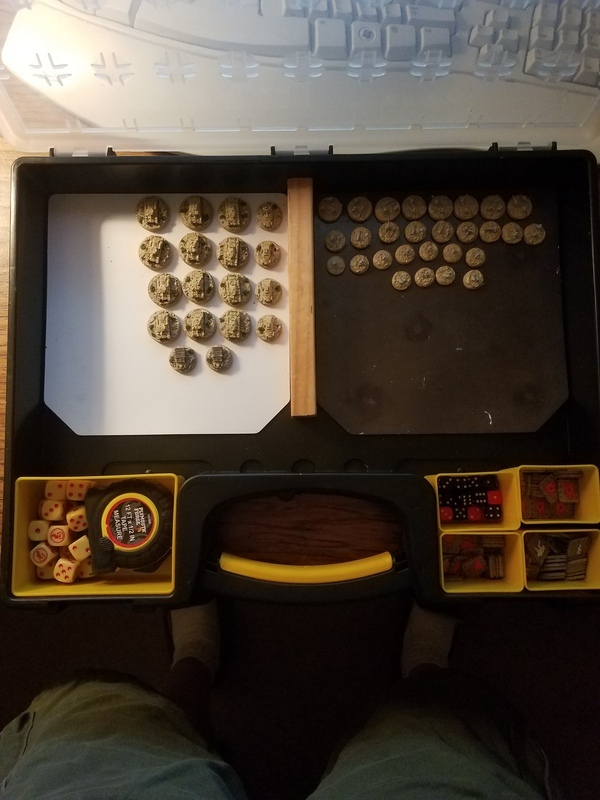 My 15mm storage system. The container is called Super Stacker, it's designed to store paper or crafts etc. I cut a board to fit inside installed screws to attach to the magnets I glued to the underside of my vehicles. I can adjust the screw height to fit the vehicle simply by using a screw driver. 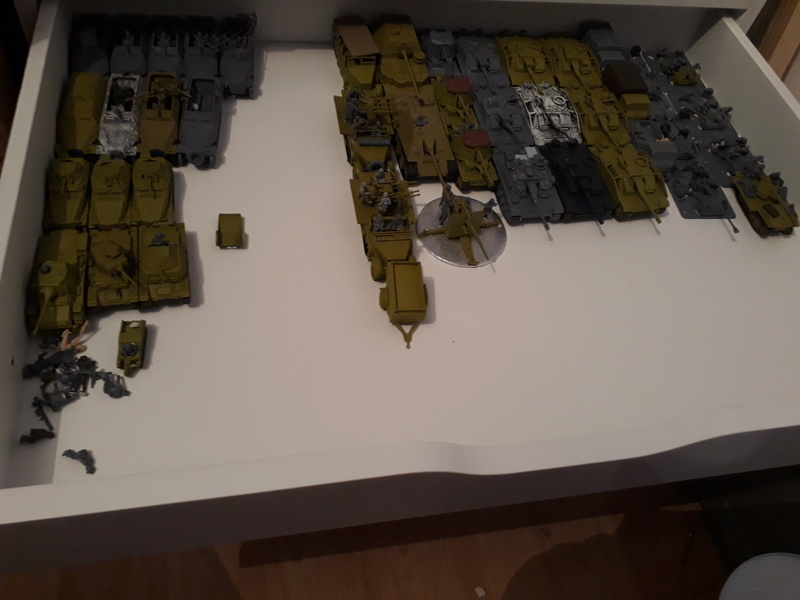 It can hold 20 vehicles comfortably, I could fit more if I desired but since the boxes are only $5.88 USD each, I didn't see the point of cramming them in the box. The holes in the board are for easy removal and I put felt pads on the underside to keep whatever surface I place it on safe from damage. Love the screw in board plan - much better than the thin steel sheet. Can see this getting put in place for my 1/144 planes as well as 15mm Hueys for Ia Drang. Thanks, I was trying to find an easy way to attach them without using metal/magnetic strips. Another bonus using magnets under the vehicles is I can use a nail (or anything metal) for a handle to attach to for painting. 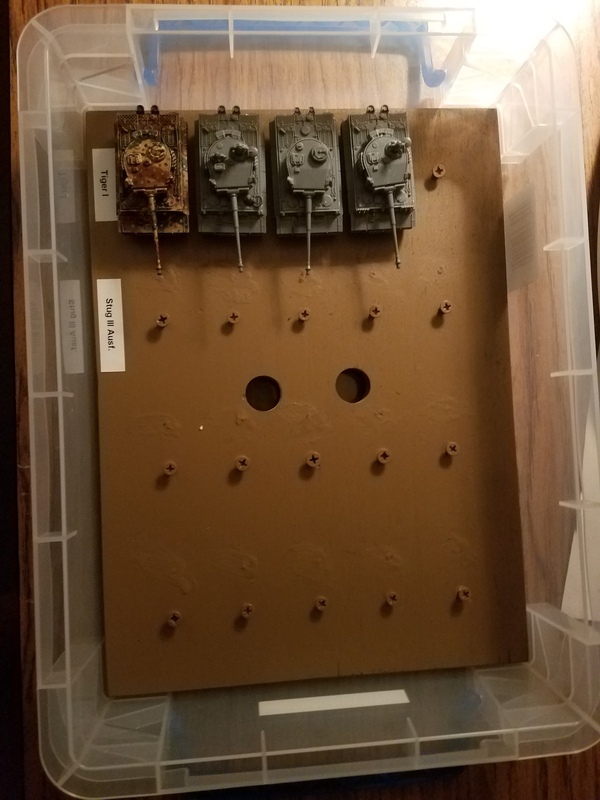 I also use a board with holes drilled into it to fit the nails and that's serves as a drying rack. The screw board with magnets underneath is brilliant. 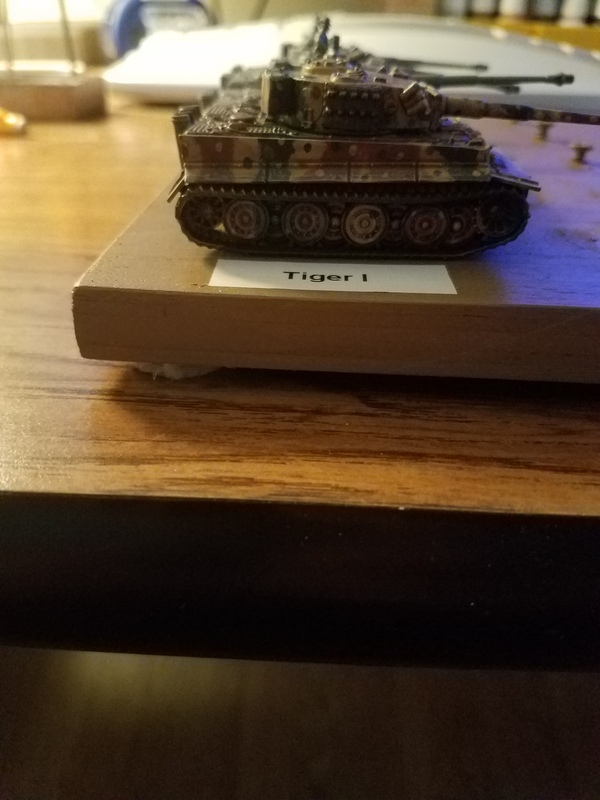 May have to try that, as I don't really like my tanks sliding around. I made myself this little chest of drawers to store my 6mm stuff. My 15mm stuff is scattered all over the place in plastic cantilever toolboxes. Really awesome storage you guys have! I've thought about something similar but haven't found the right chest of drawers type storage. I'm always on the lookout for a cheap (or used) map/blueprint file cabinet, but they tend to be priced too high for anything well made. For now though, I'm happy with my current storage setup. 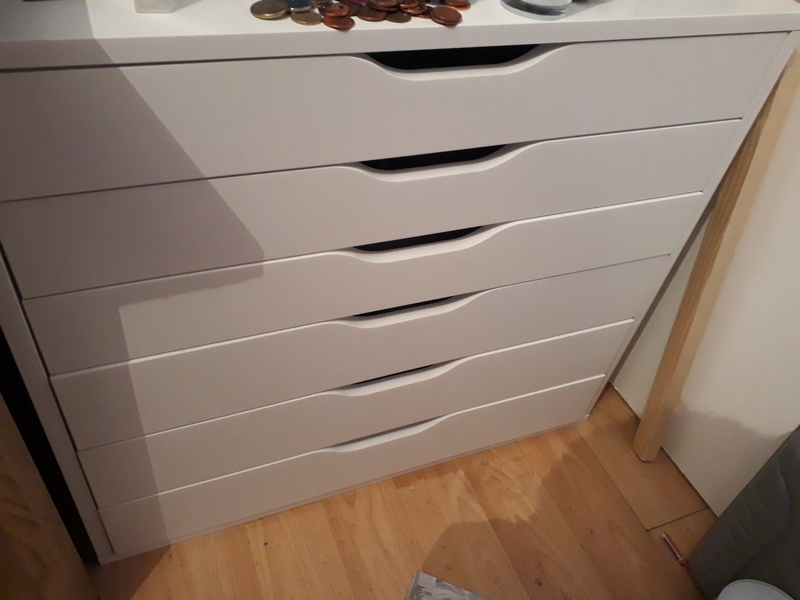 @Fitz, excellent work on making your own chest of drawers! As I don't play much at home, mine is all stored in plastic folding crates from The Range in the U.K. 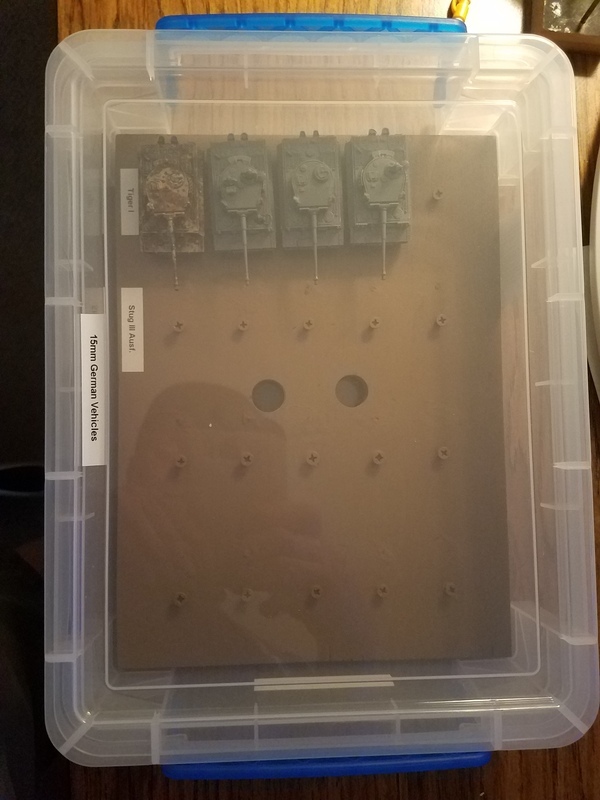 These hold exactly 8 A4 storage boxes with just enough room to slide your fingers down the side to get them back out again. It means I just have to find the right box, drag it off the shelf and into the back of the car for the trip to the club. 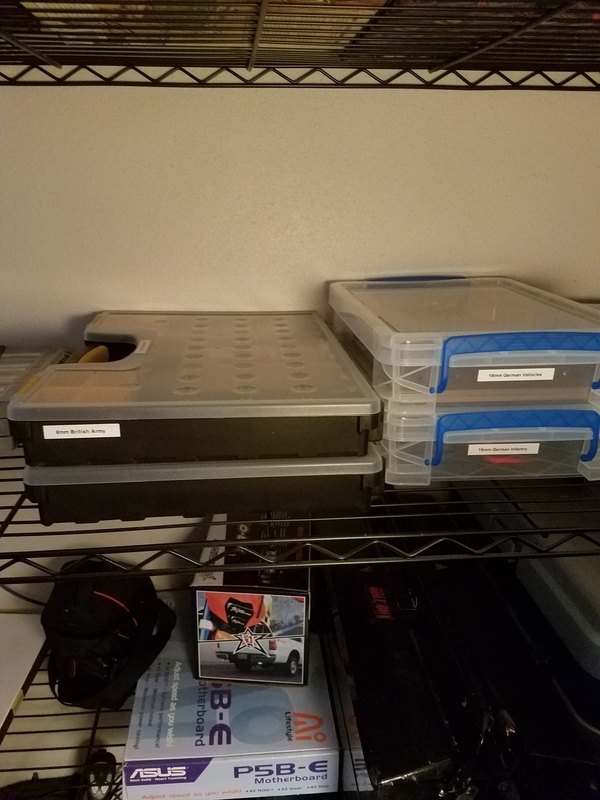 I'm about half way through converting all the old storage, which is in random sized boxes including old shoe boxes etc stashed equally randomly on the shelves in my garage. Now, if only I could find a way to store all the terrain items in A4 storage boxes. 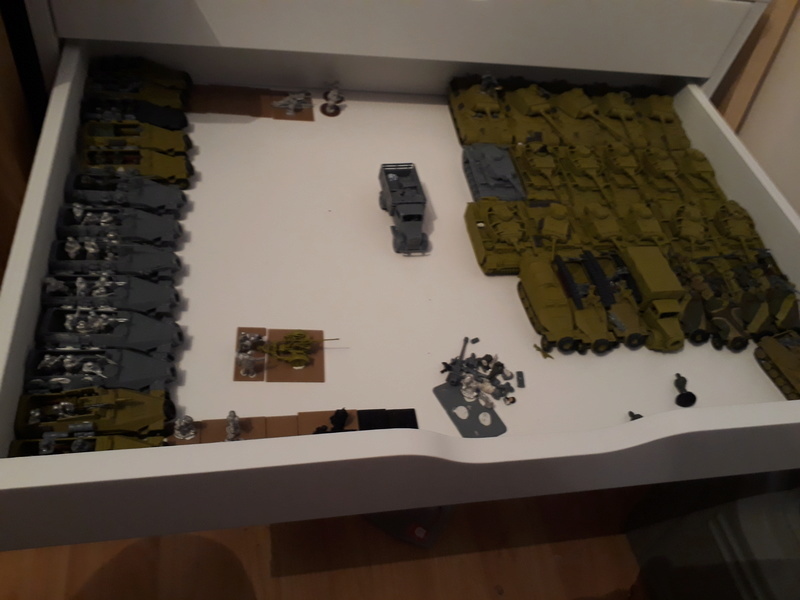 Sadly, at the moment they go loose into the folding crates, unless it's 6mm terrain, in which case they mostly fit into the A4 boxes.